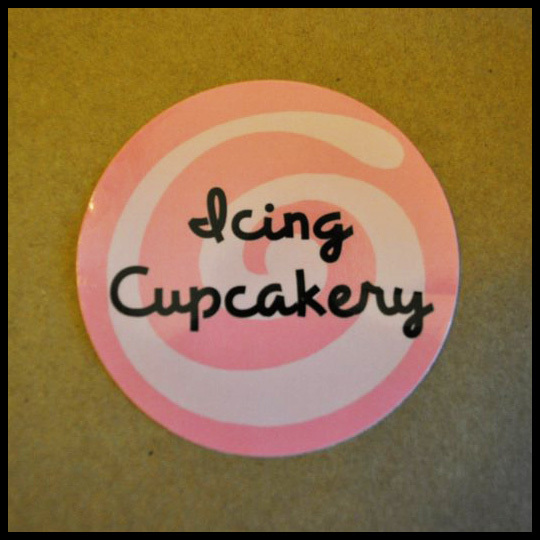 We are excited to share this guest post from fellow cupcake addict Kim of kimberlyloc.com. Every Tuesday for the month of November (except today, because we’ve been on vacation), check out Kim’s guest posts as she names her top five favorite cupcakeries the Kansas City suburbs. Visit kimberlyloc.com every Tuesday in November to see our top five picks for our favorite cupcake shops in Baltimore City. When I found Icing Cupcakery during my hunt for the best cupcakes in the Kansas City suburbs, I had no idea it was new (it just had its grand opening last weekend and has only been in business for a few short months!). I rarely visit Lenexa, so I just assumed I was out of touch with some of the charming shops and bakeries in my neighboring suburb. Sometimes when you visit new places, it’s really hit or miss. Either the staff is really frazzled or the food is a bit off, but not with this cupcakery. This sweet little shop, located in a strip mall area (as is everything in the suburbs) on a steep-ish hill, made me feel at home from the moment I walked in. Though it was a bit quiet, I was quickly greeted by two teenage girls who had big smiles and great attitudes. Immediate points for the lack of the “Can I leave yet?” attitude of some teenage, minimum-wage workers. I picked out four cupcakes to test. Salted caramel and Southern Belle (Red Velvet) were no-brainers, but I had the girls give me recommendations on the other two. At $3 a cake, these cupcakes are competitively priced for the Kansas City suburbs’ cupcake market. They’re a little smaller than some of the other cupcakeries’ goodies, which is one reason why I placed Icing Cupcakery a bit farther down my list, but I think there’s room to grow (literally) here. I probably don’t need a bigger cupcake, anyway! The first cupcake I sampled was the Salted Caramel. This is always a favorite flavor offering of mine because you just can’t go wrong with salty and sweet frosting. Well, unless there’s something up with the cake. Unfortunately, the cake was just a bit dry. The frosting was phenomenal, though, and the little touch of sea salt on top added a nice layer of flavor. I’m on the fence on whether I’d buy this cupcake again (it’s only available on Thursdays anyway), but if Icing Cupcakery offered salted caramel frosting shots, I’d be all over it. The next cupcake I sampled was the Mint Chocolate Chip that one of the girls recommended. So glad I took her up on that Andes Mint suggestion. The chocolate cake was so moist and rich and the minty green frosting had the right balance of flavor and texture — not too minty, but refreshing, and creamy, but not uber-thick and gooey. The chocolate chips on top were a nice finish. 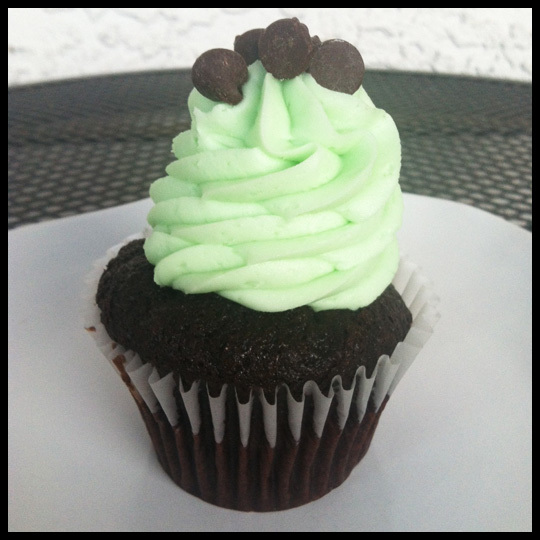 Great addition of yet another texture — chewy crunch — that really solidified the “after-dinner mint” feel of this cupcake. I would definitely buy this cupcake again. Moving on to the Southern Belle, a red velvet cake with a fabulous name (I’m a Southern native), I took a moment to admire the beauty of this iconic cupcake. Definite presentation points here! I also like how the frosting covers a bit more of the cupcake top — I don’t like balding cupcakes (and we all know I love my frosting!) 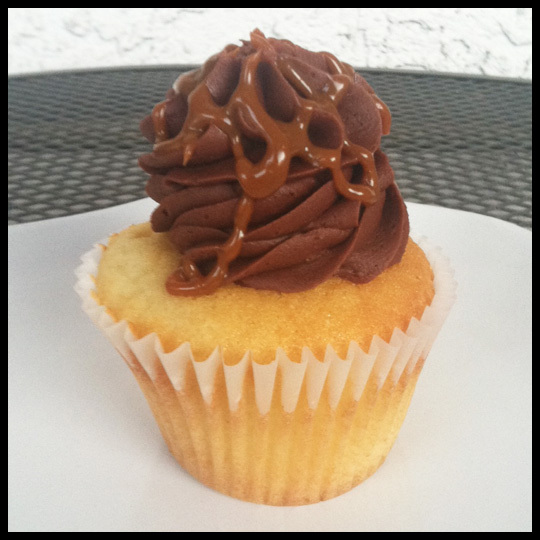 — compared to the salted caramel cupcake’s visible surface area. The Southern Belle cupcake had the same issue as the salted caramel cupcake — great frosting, but not-as-moist-as-it-could-be cake. However, because this is a staple cupcake for pretty much any cupcakes anywhere, I’d give this another try — perhaps it was just a fluke. 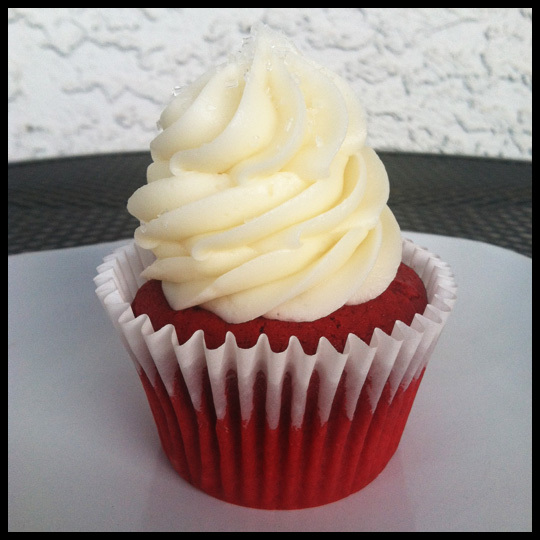 Because seriously…you have to have a knockout red velvet cupcake, especially with a sassy name like Southern Belle! 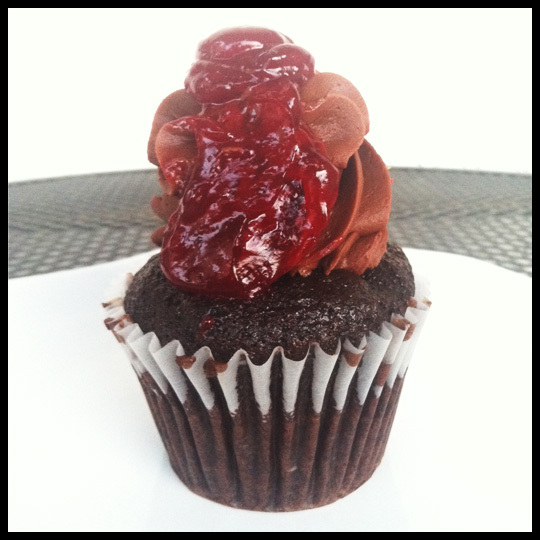 From sassy to mysterious, the last cupcake I sampled was the other recommendation, Black Forest. I was skeptical of that oozing berry jam when I first saw this cupcake in the display, but I’m so glad I got it. This cupcake was my favorite of the batch I tasted! The dark chocolate cake was to die for. Coupled with a light, semi-sweet chocolate frosting and drizzled with berry jam, this cupcake was the perfect marriage of decadence, creaminess and a kiss of tart and fruit sweetness. You must try this cupcake if you ever visit Icing Cupcakery. You may walk away with jam slathered all over your face, but you’ll also be smiling and satisfied. So, what makes a new cupcakery feel like home to you? What experiences have you had with young employees? Do you take employees up on their recommendations — I’m so glad I did, because the two that they chose for me were my favorites! Tell me your thoughts in the comments section. This entry was posted in Cupcakes, Kansas City and tagged best cupcakes in kansas city kansas, best cupcakes in kansas city suburbs, best cupcakes in lenexa, icing cupcaker cupcakes, icing cupcakery, icing cupcakes lenexa kansas, kansas city cupcakes, kimberlyloc cupcake reviews, kimberlyloc cupcakes, lenexa cupcakes, lenexa kansas cupcakes by Stacy. Bookmark the permalink. I really love chatting with the staff to get their opinions for help making selections. Customer service always plays a big role in how I rate a place. The chocolate cake on the employee recommendations looks moist and delicious just from the photos. You are really starting to sell me on Kansas City! I am so glad your overall experience was a good one! Everything is made from scratch every morning. You will have to try our Chocolate Dipped Strawberry next time-it’s our signature flavor! 🙂 Thanks for the review!